"History tends to portray the European empires as the creations of kings and nation-states. 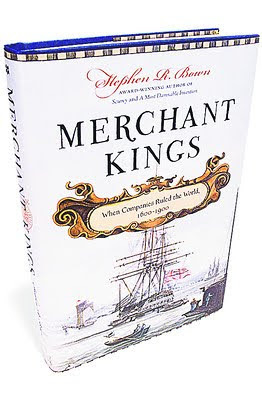 But as Stephen Bown's "Merchant Kings" reminds us, private economic interests did as much as statesmen to colonize the globe on behalf of Europe. Particularly in the 17th and 18th centuries, when European states struggled to modernize themselves while burdened by the costs of war, monarchs regularly privatized the business of empire. They chartered national trading companies, granting them valuable monopoly rights to do business in far-flung locales -- and to outfit private armies, conduct diplomacy and negotiate treaties. The British and Dutch, with their advanced commercial economies, were particularly fond of the device. The original intent was to organize trade, but the temptation toward direct conquest and rule often raised the "animal spirits" of the trading companies. In an age when correspondence between Bombay and London could take six months, states could do little to tame the companies. The results could be staggering. Private trading interests founded important colonies such as Massachusetts and Virginia. For generations the Royal Africa Co. monopolized the British slave trade. The Dutch East India Co. ruthlessly dominated the Asian spice trade for decades. In Bengal, the English East India Co. governed and taxed nearly thirty million natives long before Queen Victoria was crowned Empress of India. Until 1870, England's Hudson's Bay Co. governed nearly 1.5 million square miles of Canada on behalf of a few hundred investors. This was private colonizing on a scale to make Halliburton and Blackwater blush."